A developer came to BDIP and said he “hasn’t sold a lot in 10 years. He needed new marking and he was going to lower the price of the lots”. We said, “No you should rebrand, raise the price of the lots and do the “Test Reside”. Do you know what a “Test Reside” is? Of course you don’t BDPI invented it. Instead of looking at and walking around their lot they could now stay on their potential home site for three days and two nights. 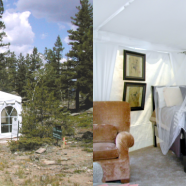 They would stay (reside) in wedding type tents furnished with exquisite furniture and their window would face a majestic view, the same view their new home could have. The potential buyers could then go to the community tent for food and drink and meet their potential new neighbors. Heck you can test drive a car for 48 hours why not your largest purchase? They sold a lot the first day and later quickly sold out the first phase.